WENB have released the much-anticipated details regarding the upcoming DLC, which Jon Murphy stated would bring a surprise to the PES community. The download will be available for PlayStation(R)3, Xbox 360 and PC-DVD users, and adds a number of new items to the game. Twelve kits have been updated within the game, including those of the Ireland national team, and some French clubs sides. Similarly, ten new licensed boots styles from manufacturers such as adidas, Puma, Umbro and Mizuno have been added. 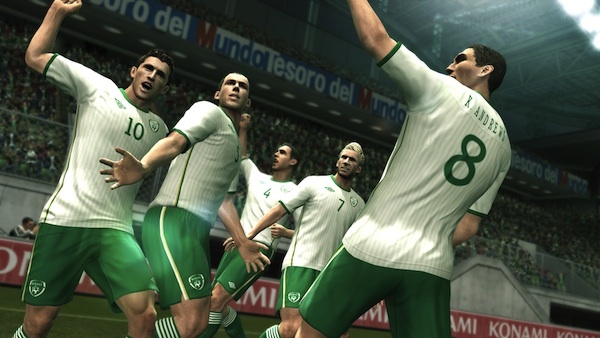 Further free DLC will be released for PES 2011 during the coming year. I'm not entirely sure why Jon Murphy stated that this DLC release would cause surprises. Nonetheless, I hope you're excited about the news. It's always cool to have a new set of boots to choose from - as well as seeing teams' kits being updated. December 21st. Next Tuesday. Hold tight, guys.